To get the easy pun for this picture out of the way: life isn’t all it’s cracked up to be. Or at least, not if you compare it to films and TV adaptations of real life events. If you’ve been writing for a while, you’ll probably find yourself going: “ooh, that might make for an interesting story” when you read a newspaper article, or come across some random facebook post while procrastinating, or even getting lost in Wikipedia as you research whatever you’re working on at that moment. But to take that germ of an idea, that event, or that person’s life and mould it into a story that works for the screen is often a bigger challenge than you’d imagine. The first thing to remember is that history as we know it has the word ‘story’ in it for a reason. It’s not just “the facts” (however precarious a concept that might be nowadays, but that’s, well, a different story). It is a historian’s perspective on events, an interpretation of facts, and more often than not, written with an agenda in mind (usually: not upsetting the people in power). A discussion I had with one of my professors at University leaps to mind. He was of the opinion that all of life is a story. I was the annoying upstart who pointed out that a story can only be a story when someone’s telling it. We need a story teller, be that a historian, a journalist, or a screenwriter. The second thing to remember is that every storyteller has their own perspective. They choose what to tell and what to leave out, which words to use, what the implication of that word choice is, and more. But you know that, you’re a writer. As a result, perhaps somewhat annoyingly, those who write history have a certain amount of ownership, of copyright on their version of events. So if you base your own version of that true story on a single account still covered by copyright, you need to sort out quite a bit of legal stuff. But by basing yourself on a single source, however well-researched it is, you’ll also be echoing that version’s possible bias. It is their perspective, after all. That’s not necessarily a problem, though it can get you into trouble when that view is considered controversial or just plain wrong. As a get-out for both of these problems, it helps to find as many possible sources of your own to base your script on. It won’t just ensure you get corroboration for events, it’ll also (hopefully) offer you enough different perspectives to put the events into some sort of context. 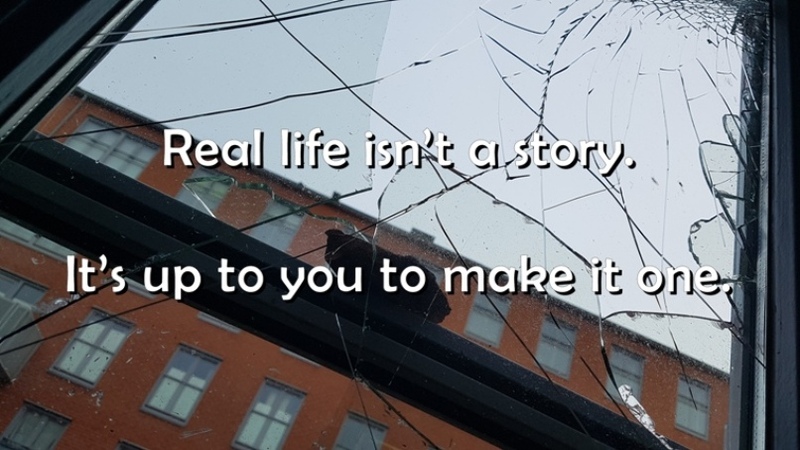 For a good, satisfying and dramatic story, we’ll need to reshape the events of someone’s life. Firstly, like with any script and story, we’ll need to work out what the themes are and what we’re trying to say to our audience about this person, or these events. From there, we’ll need to pick the relevant events from their lives that allow us to tell the story we want and – more importantly – condense and arrange them in such a way that they’ll fit into an accepted story structure, that they’ll build towards an inescapable conclusion at the end. If at all possible, we’ll also want to be true to history. There is that lovely thing called poetic/dramatic licence, of course, but that’ll only stretch so far before audiences (or reviewers) start calling foul. I remember working on a historical drama series where people were dying in the wrong chronological order. It became quite a beast to sort that out, because the deaths were meaningful to the main character and restoring them to their proper, easily fact-checked chronological order had quite an impact on her development. And there’s another thing to remember about adapting real life: we don’t always know what was going on in the minds of those involved, of the people we use as characters in our story. Tat’s rather annoying, since what motivates them and their choices is what their characters and their story is built on. That’s what – as said in a previous blog – we as an audience latch onto and engage with. We want to understand the emotions and thoughts behind the facts of history. As film makers we want to expose – and as audiences we want an insight into – the humans behind the history. Often finding the human side of history can be a tougher nut to crack than just structuring the big events. It requires the writer to come up with moments in between the history, for which there are no sources, no flies on the wall; moments of introspection, or intimacy, where it’s not necessarily about getting events right, but about getting the character right. One of the greatest compliments I got was when a scene I’d written for another historical serial was dismissed by an insider as absolute nonsense that absolutely got right the relationship of the two people involved. We (writer, director and cast) had managed to capture their human essence. With all of these things to remember, I’ve found it’s a great advantage to not have to do all this on your own. To have a sparring partner, be it a script editor, a co-writer or a director (or all three). By voicing your thoughts out loud and getting either affirming or contradictory feedback, things start falling into place, ideas begin to click, patterns emerge and characters to form. And that’s when real life can come to life on screen. As an added bonus, a couple of clips of historical drama I worked on. See if you can separate the fact from the fiction, and how we tried to capture the characters’ essence.